The Air Hockey Table by Gold Standard Games - Tournament Ice features all quality characteristics of the Pro model, but at a lower price! With the exception of the electric scoring component, you'll get to experience the abacus style of keeping count. Designed by 2-time World Champ Mark Robbins, it's also definitely something to boast about in your game room. Moreover, it features commercial-quality cabinet and leg construction for longtime heavy use, as well as a commercial blower for championship-level air flow. It's also fully sanctioned by the USAA for tournament play! With its brand new modern design, it likewise features a special wear-resistant laminate top for durability, along with center-line and face-off circle for competitive play. For problem-free operation, its goal construction is heavy-duty and player-friendly. Avail the Air Hockey Table by Gold Standard Games - Tournament Ice today! 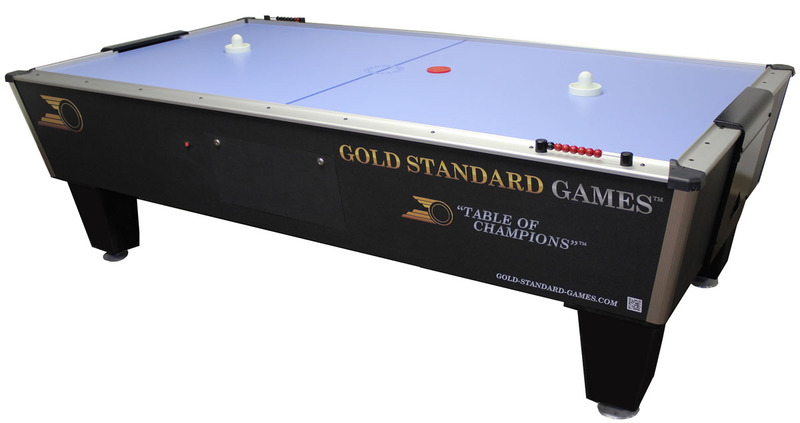 The Air Hockey Table by Gold Standard Games - Tournament Ice features all quality characteristics of the Pro model, but at a lower price! With the exception of the electric scoring component, you'll get to experience the abacus style of keeping count. Designed by 2-time World Champ Mark Robbins, it's also definitely something to boast about in your game room. Moreover, it features commercial-quality cabinet and leg construction for longtime heavy use, as well as a commercial blower for championship-level air flow. It's also fully sanctioned by the USAA for tournament play! With its brand new modern design, it likewise features a special wear-resistant laminate top for durability, along with center-line and face-off circle for competitive play. For problem-free operation, its goal construction is heavy-duty and player-friendly. Avail the Air Hockey Table by Gold Standard Games - Tournament Ice today!